Lettuce grown in the Antarctic greenhouse. 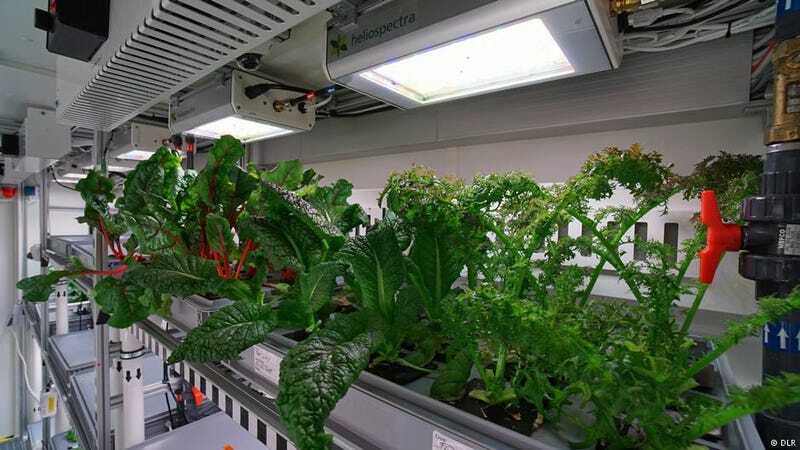 It’s called the EDEN-ISS project, and it’s taking place at a greenhouse located a thousand feet from Neumeyer-Station III, a research base sponsored by the Alfred Wegener Institute, the German Aerospace Center (DLR), and other institutions. By growing vegetables in one of the most uncompromising environments on Earth, the scientists are hoping to replicate conditions found on the Moon, Mars, and other celestial bodies. Success here means future offworld colonists should be able to grow their own food, and not depend on complex and costly supply missions. The experimental EDEN-ISS greenhouse in Antarctica. Meanwhile, the temperatures outside reached -4 degrees F (-20 degrees C). Zabel usually spends between three and four hours a day tending to his garden, and he’s had to deal with some adversity, including minor system failures and a powerful storm—the strongest to hit the region in more than a year. Zabel is one of 10 researchers currently posted at the remote Antarctic station. They eventually hope to produce nine to 11 pounds of fruits and vegetables per week, which could happen as early as this May. Paul Zabel showing off his crop. This achievement is a first for German scientists, but it’s not the first time that plants have been grown on the frozen continent. The McMurdo Station and Amundsen-Scott South Pole Station have hosted hydroponic greenhouse experiments before, with successful results. And NASA has even managed to grow some greens on the International Space Station. The difference here is that the German scientists are trying to produce a wider range of vegetables, and to set the groundwork for similar stations to be set up on the Moon or Mars. What’s more, the system could also be used on Earth in places where the climate is harsh or unpredictable. The scientists do not appear to have attempted to grow any greens of a... uh... recreational nature, but given the success of these crops, it seems it would be quite possible. The thought of having some sweet leaf, sitting back and admiring the red Martian landscape sounds perfectly out there.